Windows are a key component of your home and offer many benefits. They look great, are energy efficient and increase your home’s value. However, if you have drafty windows, you won’t enjoy any of those great benefits. When you’re experiencing a draft from your windows, that’s a very bad sign. That means outside air is getting into your home and your windows are probably damaged. You’ll need to know what happened and how you can prevent it from happening again. It becomes an even bigger problem in Milwaukee when the weather is constantly changing. In this article, you’ll learn everything you need to know about drafty windows. Your home’s beauty, value and energy efficiency are all counting on you. Why Is it Important to Fix Window Drafts? First, let’s explain why we’re making such a big deal about window drafts. When outside air gets into your home, it manipulates the temperature inside. So when you set your thermostat, your furnace and air conditioner have to compete with your drafty windows. This causes a few things to happen. The first is your house will never be a comfortable or consistent temperature. Some rooms will be way too hot while others will be freezing cold. You’ll never truly be comfortable which is an awful feeling to have in your own home. More importantly, you’re going to spend a ton of money on your energy bills. Since your furnace and air conditioner are in constant battle with your leaky windows, it becomes much harder to reach your desired temperature. Your heating and cooling machines will have to work hard causing them to use more power. Your bills will skyrocket. So how do your windows leak? What causes drafts to get into your home so easily? There are many ways and each one has its own set of circumstances. Some are avoidable while others are a inevitable. We’ll go over all the reasons you may have drafty windows below. One of the reasons your windows allow outside air into your home could be because they’re old. When your windows wear down over time, cracks start to develop, gas slowly escapes and the overall performance takes a dip. Eventually, you’ll need to replace your windows. That being said, depending on the style of your windows, this isn’t a problem that springs up over night. Some window styles such as vinyl windows can last up to 50 years without any problems. Be wary of wood windows because they have many problems. One such problem is how they handle moisture – a very common occurrence in Milwaukee. Moisture causes wood to expand and contract which misshapes the windows. They bow and warp until the frame doesn’t meet the sash. This is how drafts can easily enter your home. there are other major wood window problems caused by moisture such as the growth of mold and rotting wood. It’s obvious that wood windows aren’t built for Milwaukee and will be drafty in no time. Seal failure is a huge problem that can happen with double and triple pane windows. It happens when the seal that holds in the argon or kypton gas breaks and allows it to escape. When your double or triple pane window loses its gas, it’s no longer energy efficient. However, this shouldn’t push you away from double or triple pane windows, they’re still vastly more energy efficient than single pane windows. If you do notice there is a problem with the seal of your double or triple pane windows, you can have them fixed. However, in more serious cases of seal failure, your entire window may need replacement. Seal failure can be caused by poor installation so it’s important that you have a professional install your windows. Feldco has been serving the Midwest for over 40 years and is Milwaukee’s #1 window company. Get a free quote now for replacement windows and make drafts a thing of the past. Speaking of installation, having your windows installed poorly can cause drafty windows in other ways than just seal failure. If your window opening wasn’t measured correctly, you’ll have gaps between the sash and frame. Also, if the window isn’t inserted into the opening correctly, your home won’t be sealed up airtight. When in doubt, hire a professional like Feldco to install your replacement windows. Don’t forget to check your caulk and weatherstripping. Both are very easy to replace and can stop your window drafts. If the caulk is cracked, remove the old caulk. 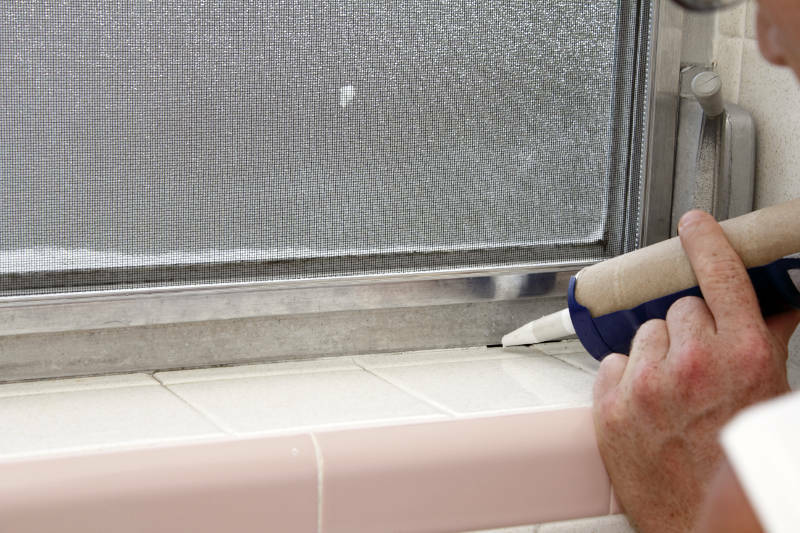 Then, with a caulk gun, reapply a new layer along the gaps of your window. Weatherstripping can be found at any hardware store and is very easy to install. Make sure it’s not worn down and is around the sash of your window so no outside air is sneaking past your window. There are several ways you can temporarily fix your drafty windows. They’re great band-aids for problems while you’re looking for a more permanent solution. That being said, these won’t save you much money and your windows won’t look their best. Below, we’ll go over a few ways to keep your home somewhat comfortable while you look for a solution. Window film is extremely cheap and easy to install. Most department stores offer it and all you’ll need to do is blow dry it to your windows. It works as an extra layer of insulation and covers up gaps and cracks in your windows. The problem is that its made cheaply. It won’t last more than a couple of weeks before it starts to fall off or tear. That being said, it’ll get you through a rough patch. Storm windows are a lot more expensive than window film but they work well in conjunction with your windows. Like storm doors, they simply add another layer of insulation and project your windows from the elements. That being said, if you have drafty windows, storm windows won’t solve that problem. You’ll still be losing a lot of heated and cooled air. It’s just too much pressure for a storm window to handle. Odds are you already have curtains or some sort of window treatment so this solution won’t require you to buy anything new. Much like window film and storm windows, curtains and blinds work as a thin barrier between your home and the outside world. That means it’s more difficult for drafts to get into your home. However, it isn’t impossible and that shouldn’t be your primary solution for drafty windows. They will, however, help out in a pinch. There’s only one way you can solve your leaky window problem and that’s to replace it altogether. 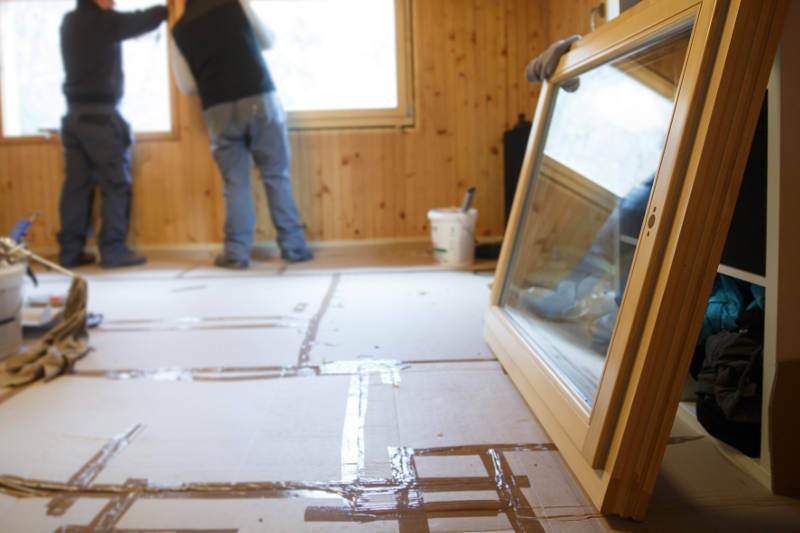 You’ll simply remove the problem and replace it with a better more efficient window. We suggest going with a vinyl window. As you know, wood windows don’t handle Milwaukee weather very well and aluminum isn’t much better. Aluminum windows absorb and retain heat hich will make your windows hot to the touch in the spring and summer. The heat will transfer throughout your entire home. Vinyl windows are resistant to warping, rotting, expanding and contrasting. They’re the perfect windows for Milwaukee homes. Plus, they have foam-filled frames which further prevents heated and cooled air from escaping your home. The more panes of glass your windows have, the less likely they are to be drafty. Double and triple pane windows add more layers of insulation and keep heated and cooled air from escaping your home. With the addition of argon gas, your home will be completely airtight. This is because argon is a dense gas and makes it difficult for normal air to pass through. How your windows are installed makes a huge difference. Hire a trustworthy professional for your window installation so you can rest assured knowing everything is being done correctly. The question is, who is a trustworthy professional? Look for a company who has been operating for a long time (over 10 years) and has done numerous projects for proof of their experience. For example, Feldco has been operating since 1976 and has served over 350,000 homeowners. Not too many companies can make that claim. Say goodbye to drafty windows and hello to more comfortable living. When you replace your old windows with energy efficient vinyl ones, you’ll feel the effects throughout your entire home immediately. Also, make sure you keep an eye out for seal failure and cracks in your caulk. They may seem small but they can make a huge difference in the comfortableness of your home and the cost of your energy bills. For Milwaukee’s best replacement windows, get a free quote from Feldco. We’ll make sure you get high quality vinyl windows that are custom-made to fit your needs. Getting new windows has never been so easy.